In 1858 begins the construction of the first winery, increased wine production encouraged the expansion of facilities in 1883. To this will be followed by 1968 and 2000. Inside the original winery (1860) is the Cathedral, a unique collection of bottles of all the vintages produced by the winerys first vintage from 1862 until today. "Talk of the Cathedral is to speak of the living history of Wines of the Heirs of Marques de Riscal and wines of Rioja"
The grapes used in the Marqués de Riscal wines grown in 1,500 hectares. Spread between Elciego and neighboring towns Leza, Laguardia and Villabuena. Poor soils, from the different terraces of the Ebro river are calcareous clay type. 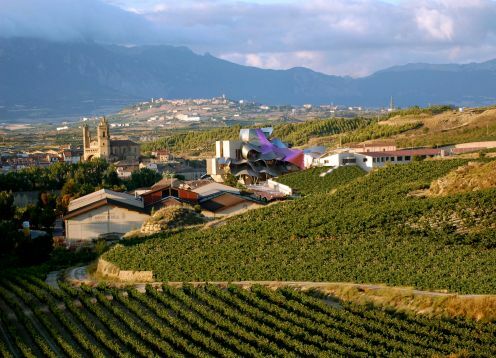 This subzone of Rioja Alavesa has traditionally produce wines with good aging potential, thanks to musts marked acidity and good tannin structure.